Basil Thai Cuisine located on 594 Main St. RT.28, West Yarmouth, MA 02673, Openning for business on late September, 2011 by Charlie Somkitcharoen and Helen Malaythong. 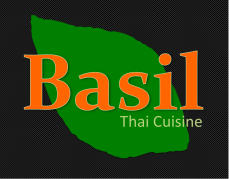 At Basil Thai Cuisine, we bring another level of Thai cuisine to Cape Cod. All of our menu selections offers nothing but the most Authentic traditional thai cooking. Every dish is prepared fresh from the best ingredients, for a rich and flavorful serving. Our goal is being the best cuisine in Cape Cod with most authentic traditional Thai, as well as modern riffs using local fresh ingredients and Thai sensibilities. We also offer a seasonal selection that we create monthly. Besides delighting the discerning palate, our kitchen takes pride in sophisticated presentation. Lastly, our staffs are eager to make your time with us a wonderful experience. Don't hesitate to ask for advice or special requests.